What makes production so difficult to manage? For all those anxious and eager to implement The Goal, Dr. Goldratt has developed a game called \\Production the TOC Way\\ in the form of computer simulator where a factory situation is simulated. 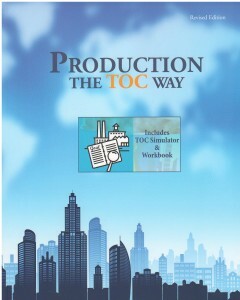 Production the TOC Way will analyze the conflict of managing according to the Cost World versus managing according to the Throughput World, examine the Efficiency Syndrome, Batch Size Syndrome, and run factory simulations based on such cases, but most important, it will reveal the need to change measurements and the rules of logistical procedures through the TOC principles of Drum-Buffer-Rope (DBR) and Buffer Management. What is the difference between the Instructor and Student version? The instructor version has the complete analysis and step-by-step guidelines for running the Simulator. The Student version is an abbreviated (condensed) version with some questions and answers as well as space for taking notes. The Student version includes a CD with the full Simulator. What are the requirements for using this material in a group training session? The instructor and every participant must buy his/her own book with Simulator. The person teaching or conducting the training session should have the appropriate credentials and lead the training using the "instructor book". Each participant in the group should follow along using either an Instructor or Student book. What is the difference between the old DOS version of Production the TOC Way and the latest Windows version? The Windows version is a stand alone software, there is no need for anything else. The Simulator scenarios are basically the same. Eli Goldratt uses a somewhat different buffers in the Windows version: the shipping buffer covers the whole production floor from materials to the shipping, and the CCR buffer, which is part of the shipping buffer. there is no assembly buffer (no need for one). Of course, the change forced a substantial change in the text. The whole approach to buffer management went through a significant change. Buffer management is presented differently in the new version of the simulator and Eli re-wrote the relevant chapter almost from scratch. The last difference is the price. With the Windows version, when someone wishes to teach he/she does not need to pay royalties. The only requirement is that every student has his/her own book with Simulator.